The inaugural River Hero Paddle Jam (RHPJ), an annual ‘weekend’ event, all about paddling and a good purpose. This paddle jam is to create opportunity and develop mentorship skills among paddlers at all levels. All this while having a good weekend of trips, challenges, food, music and paddling fun with the GCA. Please step up and lead a trip, Sunday is open for trips and new trip leaders! Smokey Mountain Meadows will be the base camp for RHPJ, tent sites # 46 through 50 are reserved for the group, we are glad to have you join in. There are marvelous camp fire makers, story tellers and guitar players among the experienced paddlers of the group, please contribute to our musical entertainment. New paddlers are always encouraged to join in these trips, many trip leaders have been taking newbies on PFDs for decades. No age limits, every paddler welcomed, a colorful group of folks, like a family, all waiting to see will show up next! 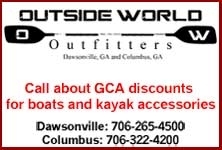 Come for the day or weekend, paddlers, friends and family are always welcome. Please pay for your wonderful Saturday evening meal with GCA/PayPal* you may have to come back and do this later. I’ll be there for Saturday Tuck trip and Saturday dinner. I’m not planning to be there for Friday or Sunday events right now.